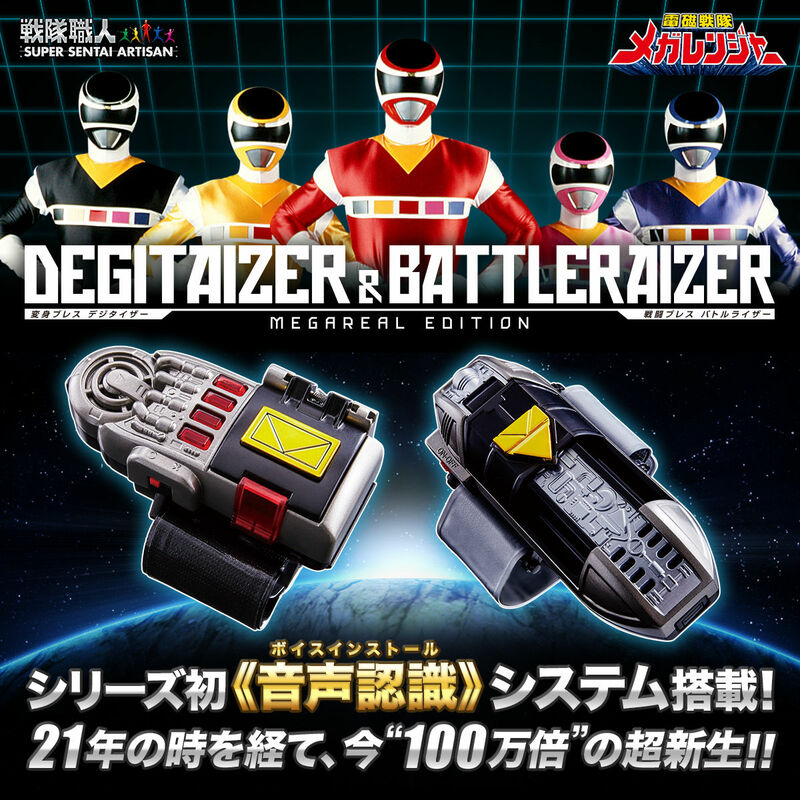 From the Super Sentai series 21th work "Electromagnetic Squadron Megaranger" broadcasted from 1997 to 1998, the transformation breath "Digitizer" that appears in the play and the battle breath "Battle Riser" are for the adult Super Sentai fans [Sentai craftsman] Appear as the latest bullet! For the first time in the history of a squad craftsman, a speech recognition system is mounted on both items, making it possible to reproduce transformation, communication and robotic maneuvering sequences closer to the play. By pressing the microphone button at the top of the "digitizer" and talking as "install", the transformation lock release sound is played. If you enter "3, 3.5, 5 Enter" with the numeric keypad of the main unit, a transformation sound will flow to mega ranger. Likewise, the battle riser plays Robo summon by sounding "Delta Mega!" By pushing the microphone button on the top. Both items We recognize more than 20 kinds of words. Also, by pressing the three buttons of the main battle riser, the corresponding attack sound flows. Includes over 70 recorded cast voices. Mega Red / Date Kenta (act: Kunihiko Oshiba), Mega Silver / Hayakawa Yusaku (act: Kanei Shigel), World Science Federation INET Scientist / Kubota Yoshiyoshi (act: Akira Saito) casts after 20 years I gathered. Also equipped with the theme song · BGM playback function. In "Digitizer", the opening song "Electromagnetic Squadron Megaranger", the ending song "I feel good". "Battle riser" can play BGM "input! Transformation code 3 · 3 · 5", "decision making! Electromagnetic combination", "winged delta mega of friendship". This product is made with a new mold different from the toy at the time of broadcasting, and it reproduces faithful modeling more in the play.